The first recipe I ever asked my mom for was her turkey meatballs. The first food I fed my infant daughter that wasn’t from Annabel Karmel’s baby food cookbook was those same turkey meatballs, pureed in the food processor, which she gobbled up with delight. And if you’ve come to visit me from America, chances are I made a big batch of meatballs, kept warm in the slow cooker in their sauce, so that dinner could be on the table as soon as I could boil the pasta when the jet lag finally started to get the better of you. Over the years I chopped and changed my mom’s original recipe until I eventually hit on this, my own version, which kicks things up a notch. I kept in loads of garlic and Parmesan but swapped the turkey, which I came to find too dry, for pork and ramped up the flavor with fennel seeds and lots of herbs. It’s now my go‐to classic comfort food dish. And if and when my kids ever ask for my meatball recipe when they’re older, this is the one I’ll give them, which I’m sure they’ll in turn tweak and make their own. My go‐to tomato sauce is Marcella Hazan’s famous recipe, but feel free to use your own favorite recipe or even jarred sauce. To add some extra umami to the meatballs, sneak in a few finely diced anchovies as a secret ingredient. I like to make loads of meatballs so that I can get two dinners’ worth out of them, but they freeze beautifully too. To make the tomato sauce, melt the butter in a large pot (one that can also accommodate all the pasta later) over a medium heat, then add in onion halves and pour in the tomatoes with their juices. Season generously with salt and pepper. Bring the sauce to a simmer, mashing up the tomatoes gently with the back of a wooden spoon. Cook, uncovered, at a very slow but steady simmer, adjusting the heat as necessary, for about 45 minutes, or until droplets of fat float free from the tomato and the sauce has reduced and thickened. Stir occasionally, continuing to mash any large pieces of tomato with the wooden spoon. Taste for seasoning, then discard the onion when the sauce is ready. While the sauce is simmering, preheat the oven to 350°F (180°C) and line a baking tray with foil or parchment paper. To make the meatballs, place all the ingredients in a large bowl. Using your hands, mix everything together until it’s just combined, trying not to overwork the mixture so that the meatballs stay tender. Shape the mixture into small meatballs the size of golf balls and place them on the lined baking tray. Bake them in the oven for 20 to 30 minutes, until they’re just cooked through. Be careful not to overcook them or they’ll dry out and become tough. While the meatballs are cooking and the sauce is simmering, bring a large pot of salted water to the boil and cook the spaghetti according to the packet instructions. When it’s done, drain the pasta and add it directly to the sauce. Stir the pasta until it’s all coated with the sauce. 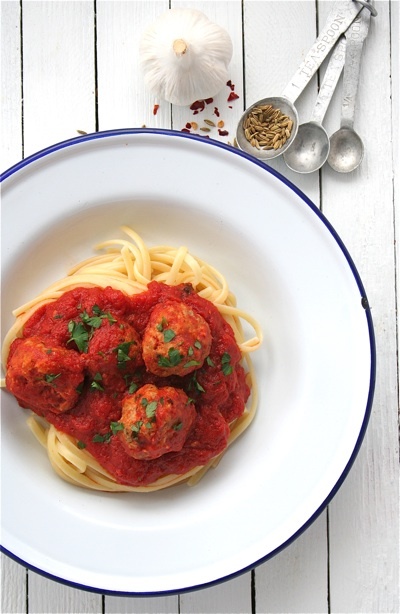 Divide the pasta between the individual bowls or plates and place a few meatballs on top of each serving. Serve with plenty of freshly grated Parmesan and garnish with the reserved parsley.